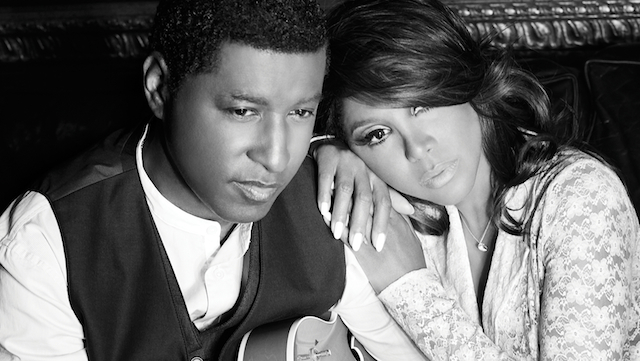 *The legendary and exquisite Toni Braxton has teamed up with artist, songwriter and producer extraordinaire Babyface to record an album titled ‘Love, Marriage and Divorce’, which is to be released on 2nd December. *The Feeling have unveiled the video for ‘Rescue’ which is the lead single from their forthcoming fourth studio album ‘Boy Cried Wolf‘, which will be available from 14th October. The video features Sonny Jones-Bextor, son of bass playing band member Richard Jones and Sophie Ellis-Bextor and is a glorious carefree spirited adventure. The song itself shows business as usual for band as ‘Rescue’ offers a refreshed sonic outlook which is warm, heartfelt sentiment with added charm and personality evoked through Dan’s distinctive delivery. *Following the tremendously amazing 2012 album ‘Fear & Freedom’, Ricki-Lee has unveiled ‘Come & Get In Trouble With Me’ as the lead single from her forthcoming fourth studio album. Released digitally on 30th August, the track is a playful, insanely catchy, hyper uptempo number with pounding bassline and one which displays *those* vocals perfectly. *Following the release of her captivating self-titled debut in 2011, Anna Calvi returns with her second album ‘One Breath’ on 7th October. The first taster of what to expect is captured on ‘Eliza’, which is a foot stomping extravaganza – it retains the fire and spirit that made her debut so attractive but also moves the sound forward, offering a sultry urgent, wild vocal cry against choppy, propelling guitars. Lovely stuff indeed. *Poliça are five piece from Minneapolis who released their gorgeously sublime, far reaching debut ‘Give You The Ghost‘ in 2012, and was met with unanimous universal acclaim. The band return on 21st October with the follow-up record ‘Shulamith’ which features the lead single ‘Tiff‘ which features Justin Vernon of Bon Iver and their latest release ‘Chain My Name’ which is a jangly, spiky beat driven number that twists an upbeat, electronic terrain, whilst the vocal from Channy Leaneagh is yearning yet alluring. *Jessica Mauboy showcased the video for her latest dance-pop single ‘To The End Of The Earth’, earlier this month. The track is the first to be taken from her forthcoming third studio collection, which is due in the autumn. *Sheryl Crow is gearing up to deliver her eighth studio effort with ‘Feels Like Home‘. Ahead of its release, a three track live EP titled ‘The Live Room Sessions’ was recorded for is available to download from NoiseTrade and features acoustic versions of new songs ‘We Oughta Be Drinkin” and ‘Best Of Times’ alongside classic hit, ‘If It Makes You Happy’. Further details can be found here. *Joss Stone is offering a free download of a new song ‘The Simple Things’. Of the track, Joss notes “I wrote this while driving around Europe with my doggies and a man who loved me at the time as I loved him back. This song was about our beautiful stress free days we rarely had. A day where you look up to the sky and decide the sun is shinning just enough to spend the spare hours we had, out side with our bare feet in the grass. Those days have passed but the feeling remains very much alive captured in this song.” You can download the song here. *Following recent band reunions and so forth, *NSYNC, Danity Kane and TLC have all joined Twitter. Click on the band name to follow. *Editors released the brilliant ‘The Weight Of Your Love‘ album last month. The band will embark on a mammoth eighteen date UK tour. 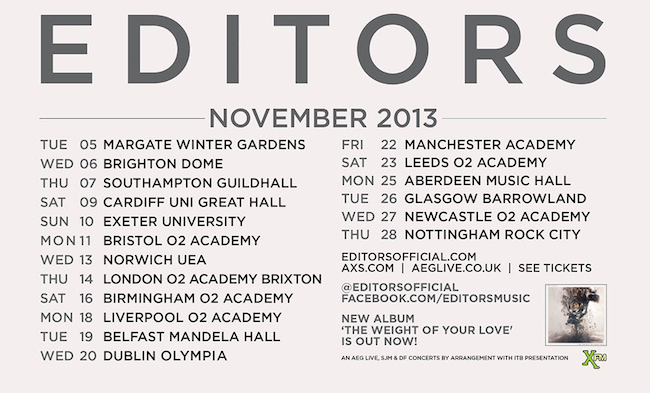 Details of dates and venues can be found below.